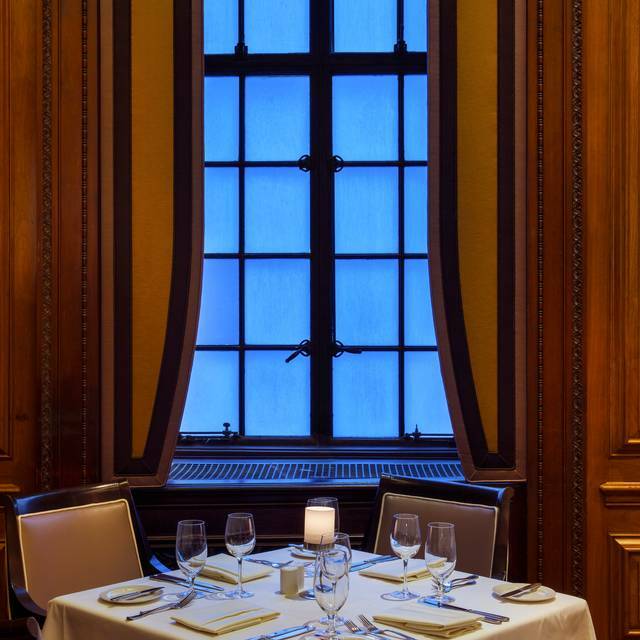 You must make reservations at least 5 minutes in advance of the time at Parker's Restaurant - Omni Parker House. Let our courteous valet staff park your car for $20 with restaurant validation or self park at PI Alley down School St., to the left on Washington St.
Green Line & Red Line to Park Street. Blue Line & Orange Line to State Station. In-House catering and function space available 7 days a week. Call our Catering Sales Department for more information at 617-227-8600. 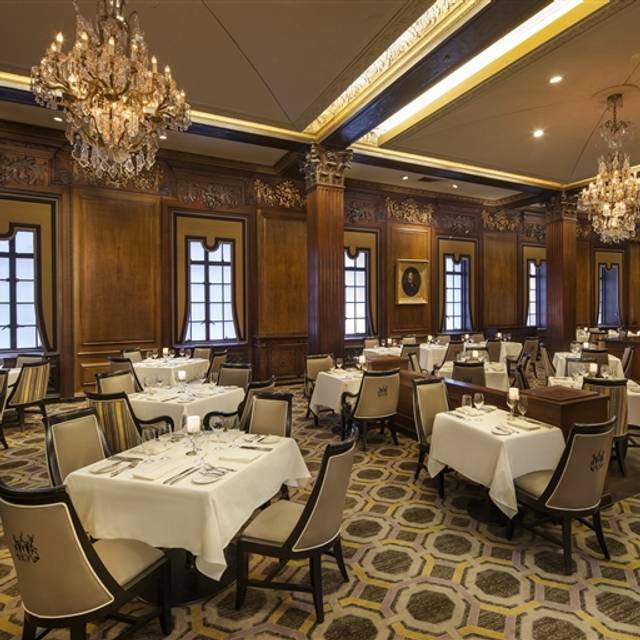 The historic and beautiful Parker's Restaurant is your destination for fine dining in Boston. Our Executive Chef, Gerard Tice, is a master at creating a feast for your senses. He deliciously combines classic New England cuisine with contemporary-American flair at the birthplace of Boston Cream Pie, the Parker House roll and Baked Boston Schrod. Gluten Free & Vegetarian Menus Available. Appropriate dress is required. Jackets for gentlemen preferred. Shorts and shirts without collars are not permitted. Footwear is required. It's not just for dessert anymore! Order San Pellegrino. Never got it. Not cool. You can do better. Parker's is the best dining room in the city. Service is outstanding, staff is friendly and knowledgeable, and the ambiance of the room is without equal. Love the vintage charm of this place, the history, and the fine dining! Love the history here and pictures depicting another time. Variety of offerings to cover many palettes. The salmon was a notch above! It was a business lunch and very much appreciated a non rush but attentive style of service. Thank You. The service is very good, I enjoy having breakfast at the Parker's Restaurant every morning. Also, I did show up for breakfast on Monday, March 18 at 8:30 instead of 7:30 and still got in with no problem at all. Great for a business breakfast but still a bit expensive for Boston. Thought this restaurant was included in restaurant week.. Disappointed that they did not have menu. Made reservations based on this. Loved the Boston Benedict & the staff was very attentive. We did the Pre-Theatre dining option. Food was well prepared and delicious. Waitstaff very attentive and professional. It's nice to be able to dine in a quiet traditional setting with no "glitz". 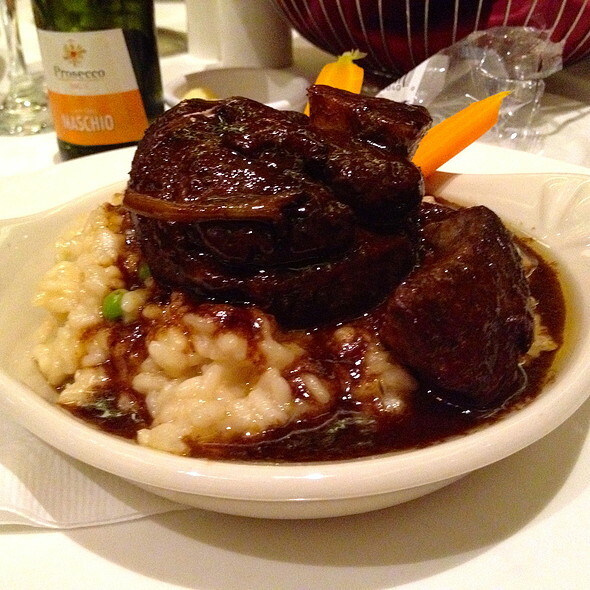 We have dined at Parker's in the past and will certainly return again. The service was impeccable; attentive without overwhelming. The food was delicious and of course the rolls were outstanding. Could not have asked for a better evening. It is a consistently good meal with excellent service and fine dining atmosphere. For those who appreciate it, it never changes its classic style. As always, it was an exceptional evening of food, service (Lillian is fabulous), and ambiance. Delicious meal and engaging waiter with a good sense of humor. We had the most wonderful experience at Parker's. Our food was wonderful. Our waiter seemed to really care that we enjoyed our time that night. We were celebrating our anniversary and my husband's 60th birthday and our waiting gave us great recommendations for food and this amazing wine! He was so friendly and we will recommend this restaurant to any of our friends visiting Boston. Thank you for treating us so well. We loved our waiter. He has been a waiter there for a long time. The hostess was also very helpful and sweet. Thank you Parker's! Our visit to Parker’s was absolutely wonderful, and we were so pleased. We chose to celebrate our anniversary and Valentine’s Day as a combine dinner date, and our restaurant of choice was Parker’s. The staff was friendly and accommodating, and there were a handful of gluten free menu items that suited our needs perfectly. We loved it very much, and will surely be back!! Great for Valentine’s Day pre show dinner. Classic old school classy relatively quiet environment, excellent food on the special pre fixe menue, excellent service- professional, friendly, attentive. Husband and I went for breakfast. The restaurant is no doubt beautiful but I felt like I was in a box. All the windows and shades were closed and seemed so closed off. It was morning and the sun was out so a little sunshine would have been nice. Food was ok but not outstanding. I could have gone to ihop and received the same meal way cheaper. Also our server seemed less than interested in serving us. I think her name was Jackie. We had to have other servers refill our drinks and close out our check bc she kept walking past our table without stoping at our table to check in on us. I highly doubt that I will return to this restaurant. Maybe lunch and dinner are better. My daughter and I enjoyed a wonderful dinner. The service was above top notch, it’s always wonderful to enjoy a meal at Parker’s! Parker's at the Omni Parker House lives up to its reputation. An elegant setting with refined service it is truly a destination restaurant. The food was good but the service was excellent and relaxed. No one rushing you here. A charming place for a date night in Boston where a man wearing a jacket is more comfortable than not. Was disappointed in salmon entree - no flavor at all. Have heard about the restaurant for years and very disappointed. Had ordered off pre-theatre menu. What a lovely atmosphere and the food was delicious! We ordered from the PreTheater menu and made it to The Boston Opera House in time for the show! The Perfect, history filled, dinning experience that is totally satisfying from the wait staff to the cloth tablecloth and napkins to the meal. Spectacular all around. Parker's rolls and Boston Cream Pie. I'm speechless. First time in the restaurant and very enjoyable. Wish that the menu was a little more extensive though. Maybe borrow some of the food items from Parker's Bar. We ordered the steak from the pre-fix menu. The steaks came out cold. They took them back and re-heated. They still were not hot. Once reheated my steak was tough and over cooked. My wife’s steak was the same. The French onion soup was delicious. Our meals came from desert. I ordered eh Boston cream pie. It was ok. My wife ordered the chocolate cake. The cake was stale and the actual cake was hard. Needless to say the food was horrible. Not anywhere worth the price. I suggest you try another place. The staff was haughty and rude. We will not ever go back there. I gave service a 2 because it took 3 hours for 3 courses and the final course was for take away. I do not know if it was wait staff or kitchen, but service was very slow. Service was also friendly, professional and accommodating. That said, food was tasty but not exceptional. We had crab cake , root salad (excellent, btw), steak, Boston cream pie, chocolate cake. Excellent service and food. There was a wide variety of food choices. Great restaurant, food was excellent, and service was top-notch. Would definitely dine here again. Boston classic. Food and atmosphere good as usual. Food with beautiful presentation, large portions, nicely done. Atmosphere of background noise only, facilitating easy conversation. Nice experience. 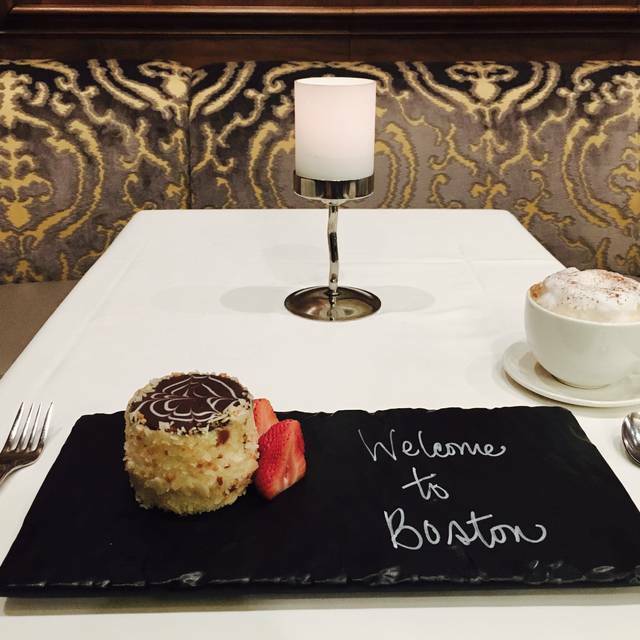 Beautiful “Old Boston” setting, attuned waitstaff, delicious food! 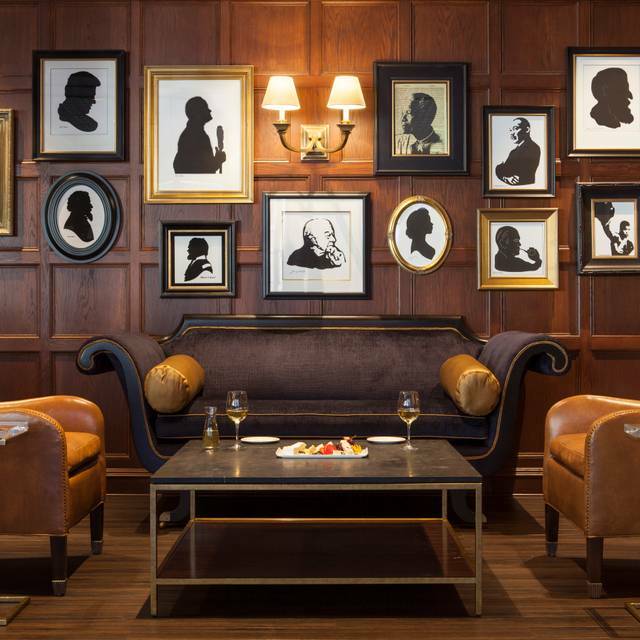 Food, service and ambiance- all excellent Plus historic elements of the hotel are interesting. Valet parking available also. Very professional wait staff and attentive. The room is relaxing and beautiful, the service attentive and friendly and the food plentiful and delicious!